But things don’t go as expected: you fumble with the exercise equipment and you don’t seem to be able to lift weights as heavy as you thought. Besides, it seems that every other gym-goer is in much better shape than you. So you go home feeling down and finally you make a decision later that evening: gym is just not for you. Very often, when we do something for the first time, we are crashing our ideals: what seemed so easy in your mind actually takes much more effort to pull off. But because expectations and reality are two different things, you feel disappointed since they don’t match each other. The first time in anything is a beginning, but at the same time, it’s not enough. Because a first time is just a touching point to something. Doing something only once doesn’t give you comprehensive experiences about the new thing. In order to do that, you need more repetitions. It’s these that repetitions give you the experiences. Did you think you would master the thing you tried right from the get-go? Did you try to do too much as a first timer? Did you expect too much of yourself? Answering “yes” to any of these questions will tell you that you weren’t necessarily prepared well enough. This has now happened to you and it has happened to me as well. 1. Set realistic expectations. For instance, if your plan is to go to the gym to become fitter, understand that the first exercise session is going to take much more time than the subsequent ones (since you are just learning the ropes). 2. Start out small. Rather than aiming to do everything at once, simply take small steps. This way you won’t overwhelm yourself and kill your motivation from the get-go. 3. Do some study in advance. If possible, learn more about your first time in advance. For instance, if I’m driving somewhere I haven’t ever been before, I take a look at part of the route through Google Street View to figure out how I should drive through certain roads and junctions. 4. Take notes. In some cases taking notes isn’t always possible. But if it’s possible, do it. This will help you remember how to do something for the second time. Then, when you repeat the new action long enough, you can throw the document away. 5. Fail a lot. This will happen naturally, but failing is the best way to learn. In fact, forget failing - replace that word with ‘learning’. 6. Remember the others. Do you think that others mastered the same thing you are doing right now in one session? No, they didn’t. Even if they failed and spent a considerable amount of effort doing something for the fist time, they still continued doing the activity, since they believed in what they were doing. 7. Stop blaming yourself and do it again. This is probably the most important piece of advice I can give you: Stop blaming yourself when you fail. You have to fail in order to grow and improve yourself. This is my blueprint for doing something for the first time. With this, I can continue doing something for the second, third, fourth and nth time. Don’t let the first time stop you, because that’s when you have just started. Leave a comment: What are your tips for preparing for the first time? 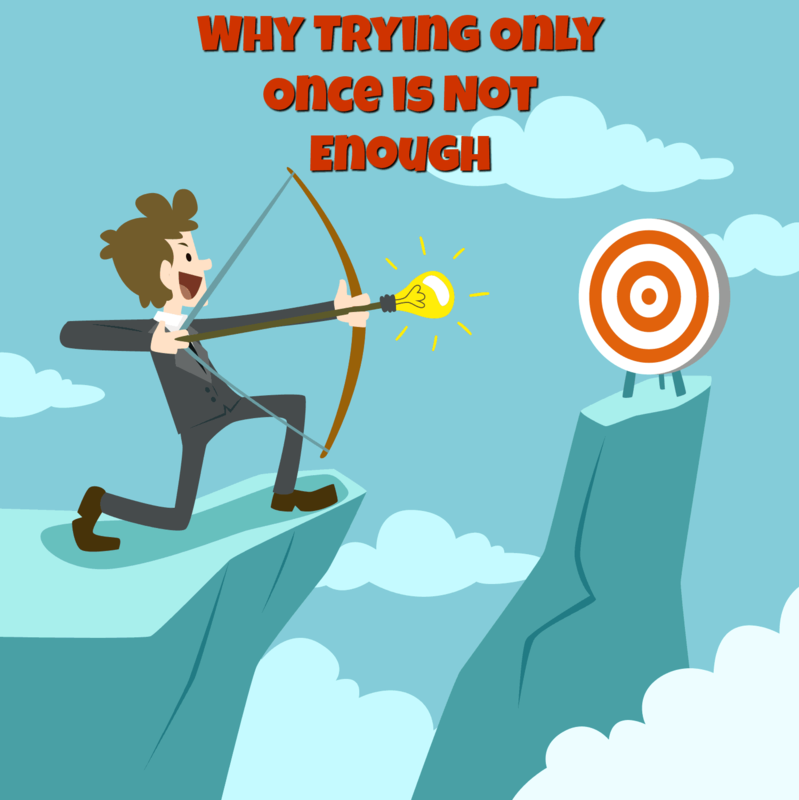 What gives you motivation to try again? Is there any particular task that you have been postponing because the first time seems so scary?